On this page, I will try to provide the general information about the Australian Kelpie that is commonly asked for. Most of the information will be taken from books or articles that I have found. So if there is anything in particular you would like to know about, please let me know and I will endeavour to research it and place the answers here on this page. This page will always be a 'work in progress' so please come back from time to time to visit and see what has been added. 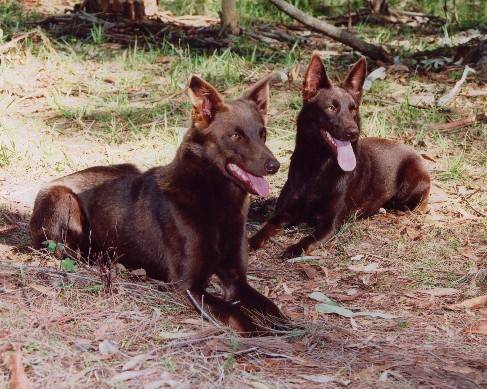 The Kelpie came into being last century because Australian sheep men needed a special type of dog that could work sheep on the vast outback properties, under variable and harsh conditions. This was a result of the various breeds of sheepdogs from Europe and the UK having proven too heavily coated to cope with the severe Australian climate and geography. The wonderful breed came from two black and tan short-coated prick eared Collies imported in the 1800s. Various other breeds have contributed to the evolution of the Kelpie as well. From these humble beginnings, the Australian Kelpie developed to the stage where it has now been exported to Russia, Norway, Sweden, Denmark, UK, USA, South America, South Africa, New Zealand, Germany, France and the Netherlands. These dogs have been successfully used to manage a variety of stock, including reindeer, goats, cattle and, of course, sheep. Kelpies in Sweden have gained police dog titles and pulled sleds. They are also being widely used as search and rescue dogs. When considering a dog, please realise that you are taking it on for its lifetime. Australian Kelpies live from between 12 to 16 years of age. Kelpies have excelled in the areas of obedience, agility and tracking. They have participated in pet therapy programs and have even been utilised as fully trained Guide Dogs. The finest characteristic of the Kelpie, however, is its irresistible personality. The breed is extremely alert, eager and highly intelligent, with a mild, tractable disposition. These dogs show marked loyalty and real devotion to duty. Although bred primarily for working sheep, the 'show bred' Australian Kelpie has proven itself to be a very adaptable and versatile dog. As a companion animal, the Kelpie has few equals. Loving, gentle and kind, its greatest joy is being on the receiving end of its owner's tender loving care, while its greats disappointment is inactivity and lack of attention. Obedience provides a great way of getting to know and share the needs of this highly intelligent breed of dog. The Kelpie is largely free from most inherited diseases and is quickly house-trained and is an easy dog to feed - eating almost anything given. The Kelpie needs about the same amount of exercise as other healthy young dogs. This can mean freedom to run in a very big yard or regular long walks. A smaller yard would obviously necessitate more frequent walks. The Kelpie coat is relatively short and needs little maintenance. It is a double coat with a dense undercoat that will require additional combing when moulting (about twice a year). An occasional bath is desirable. If you are thinking of buying a Kelpie pup, make sure that you are prepared to commit to the amount of time and degree of attention it deserves, as this breed will want to be your constant companion. Remember that the cheapest purchase often ends up being the most expensive in the long run, so be prepared to pay a fair price for you puppy. Take time to learn about the breed, in particular its care and training requirements. It is important to ensure that your yard is fully fenced. Contrary to uninformed opinion, this breed adapts well to being a family pet, jogging companion, children's mate and guardian. It craves companionship, making it among the most social of breeds. Now you know a little about the Australian Kelpie and have decided this is the dog for you or you want more information, make contact with the breed clubs or your State controlling body for purebred dogs as listed below. They will be able to give you more information about available puppies and also suggest dog shows where you can see the breed and speak to breeders. In this way you will gain a better perspective of the breed and its needs.